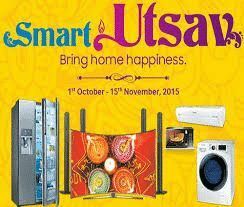 Smartutsav – Samsung come up with new innovations and ideas for their customers every year during the festive season. This time Samsung takes the initiative and launched SMARTUTSAV a unique range of exciting offers for customers. The Company aims boost customers sentiments and will last till 5th November 2016 across the country. On purchase of Air conditioners, consumers get a chance to win a free AC worth INR 40000/-, free AC installation, cash back up to 5000 INR or 2 free AC Services. In Tamil Nadu, AC installation at INR 499 only.